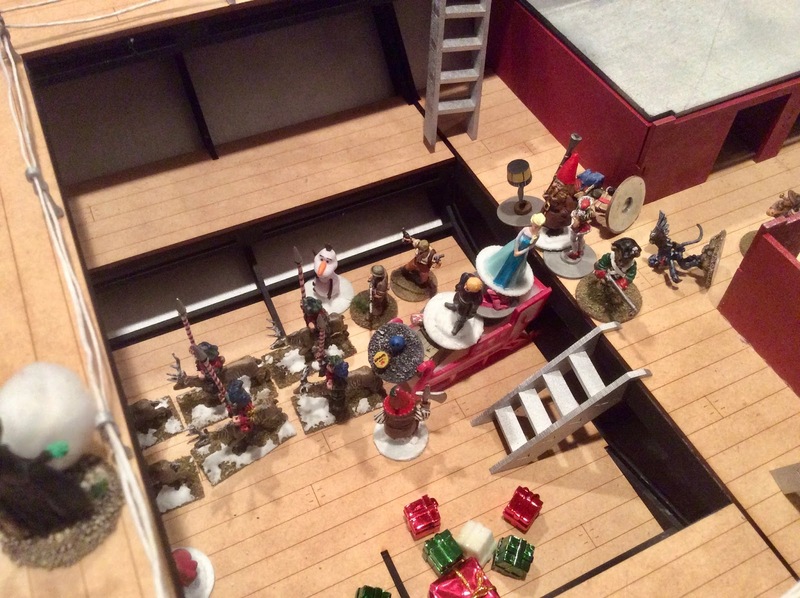 HAWK’s Annual New Year’s Eve Gaming Party | H.A.W.K.S. Chris Palmer On New Year’s Eve, HAWK’s member, Buck Surdu and his wife, Candy, hosted their annual gaming event/New Year’s Eve party for the club. 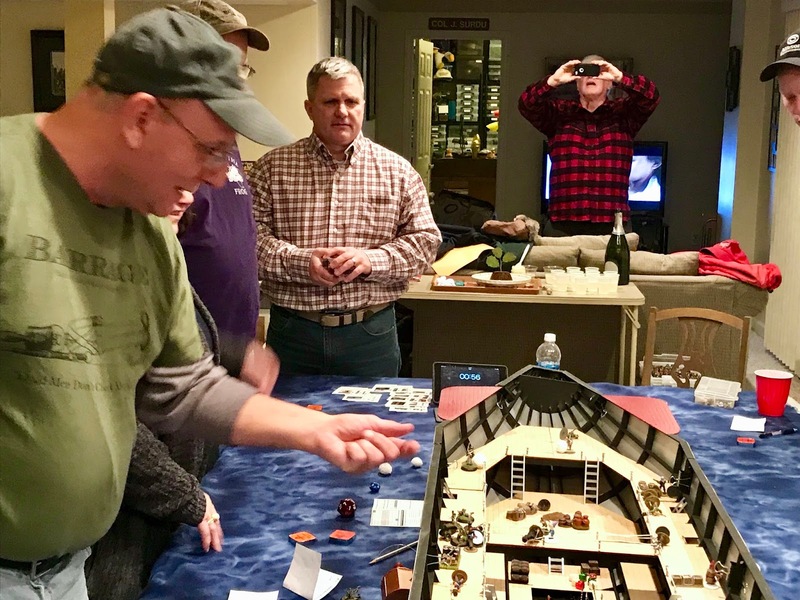 This year we were treated to two really fun games, as well as wonderful food, and great company, to usher in the New Year. 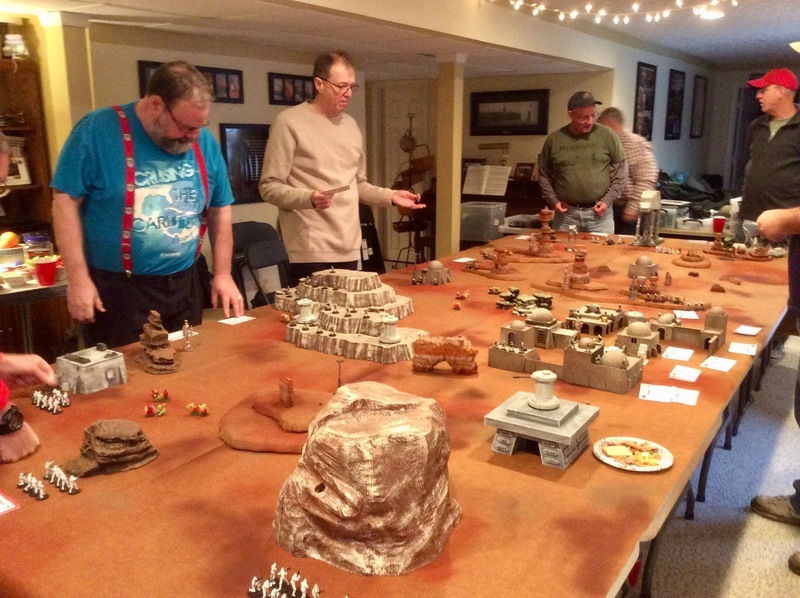 First up was a Star Wars game, using Combat Patrol’s excellent Star Wars supplement. 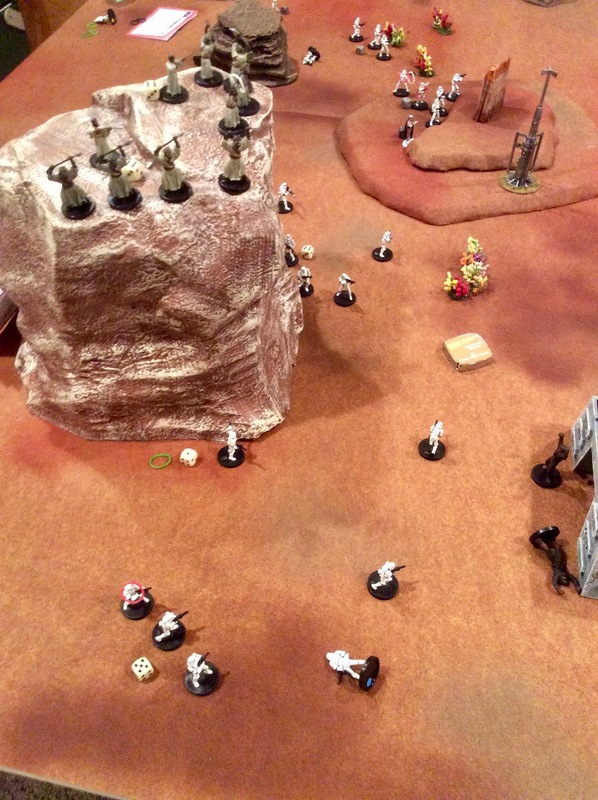 The scenario had Rebels defending an installation, while the forces of the Empire were attacking them from two directions. Besides, several squads of infantry, the Imperial force also had with them a couple AT-STs and a lone AT-AT. The Alliance had several turret emplacements, some rocket launchers and other heavy weapons; and, besides regular infantry, a squad of Wookies, and a hidden squad of Sand People, who had volunteered to help the Rebels. Luke, Leia, and Han Solo were also there. 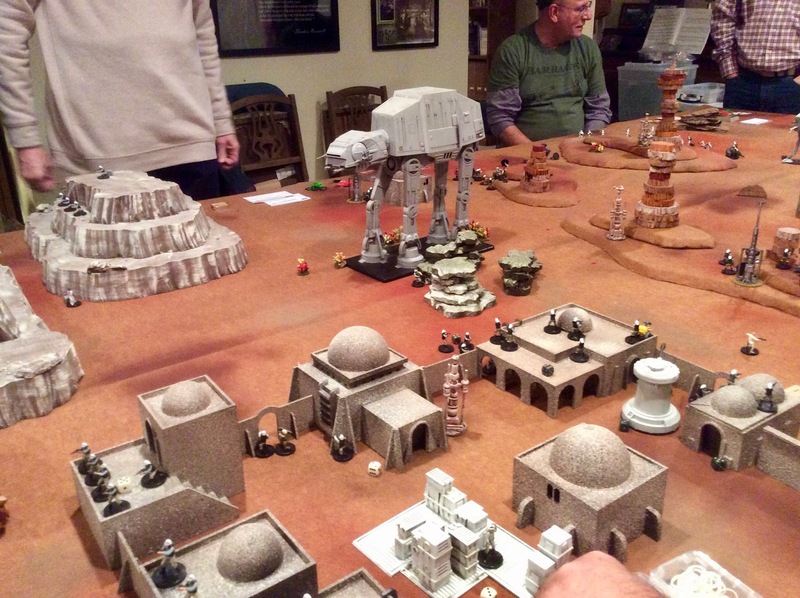 A view of the Star Wars table at the start of the game. 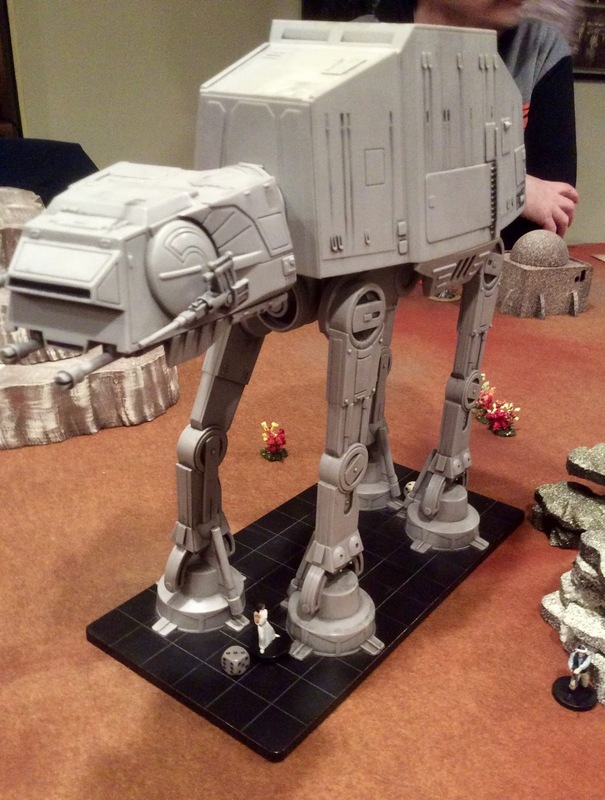 The AT-AT was run by the gamemaster on a pre-plotted path that only he knew. 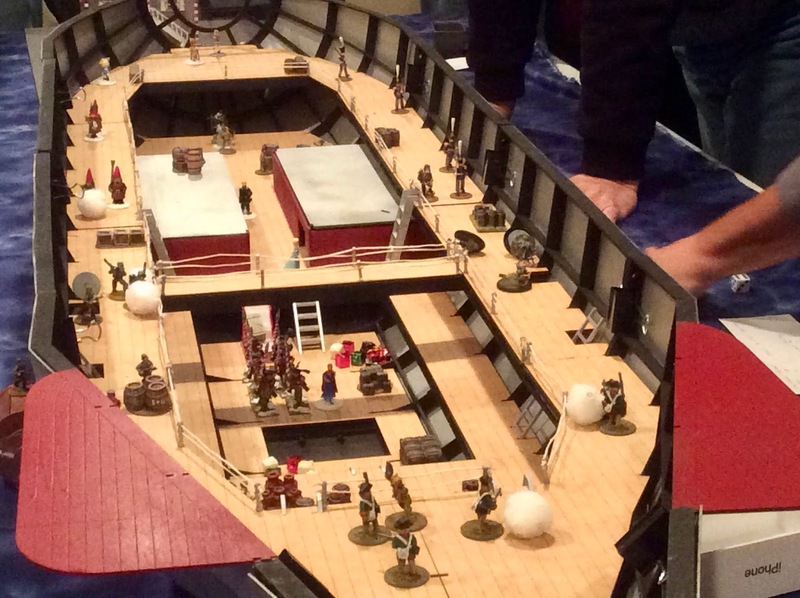 It was ordered to move directly to the walled village about midway down the table, where it would land a squad of commando type troops, and then it would fire on a large pallet of equipment in the center of the village in an attempt to destroy it. 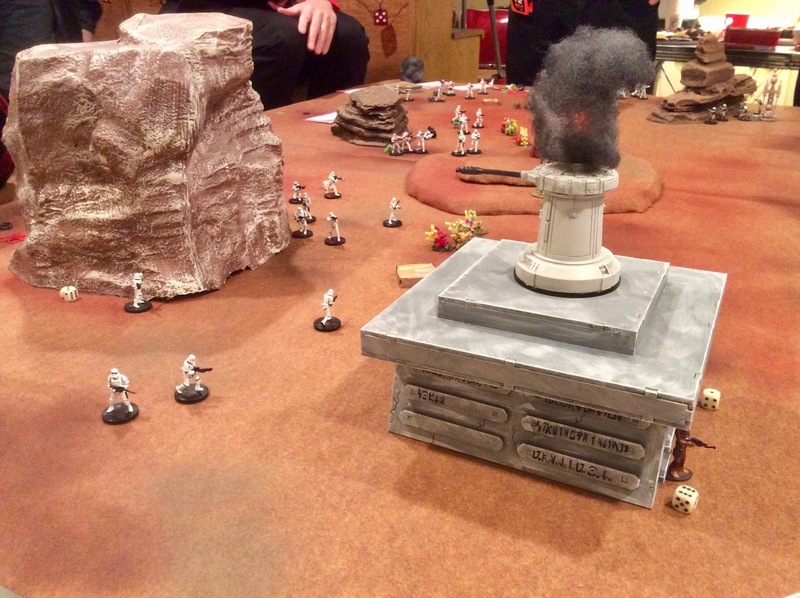 The Empire got points for destroying the turrets, moisture vaporators, and other structures on the table. The catch was, that the Imperial troops only got points if they destroyed these by hand, using thermal detonators; they couldn’t just stand along the edge of the table and shoot them from a distance. The Rebels got points for protecting these. Both sides got points for eliminating the opposing side’s heroes. With a lucky shot from one of their heavy weapons, the smaller Imperial force takes out the gun turret on the bunker in the very first turn, momentarily demoralizing the defenders. It was a tough battle, with the Rebels squeezed between two forces, but the “Good Guys” were able to badly hurt and and then halt the smaller diversionary attacking force, while the bigger Imperial force, with the armored support, made some slow headway, but just wasn’t able to get the points it needed. In the end, it was a Rebel Victory. The Rebels had protected more of the structures (7) than the Empire was able to destroy (5); and had killed two of the Imperial Heroes and had lost only 1 (Han Solo). All in all a fun battle! 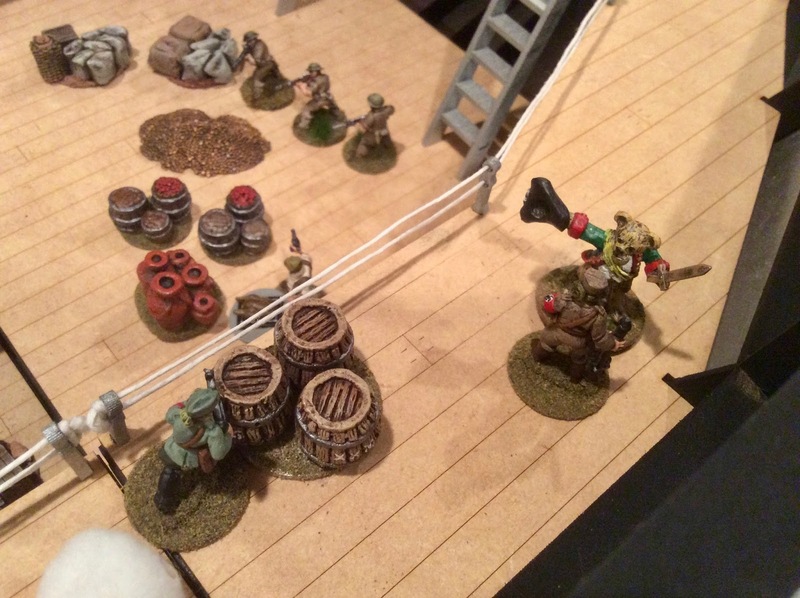 As the attackers approach the bunker, a squad of rampaging Wookies bursts out the bunker’s door and charges them. Though most of the walking carpets are quickly cut down by laser fire, a few manage to pull a limb or two off a couple poor storm troopers. 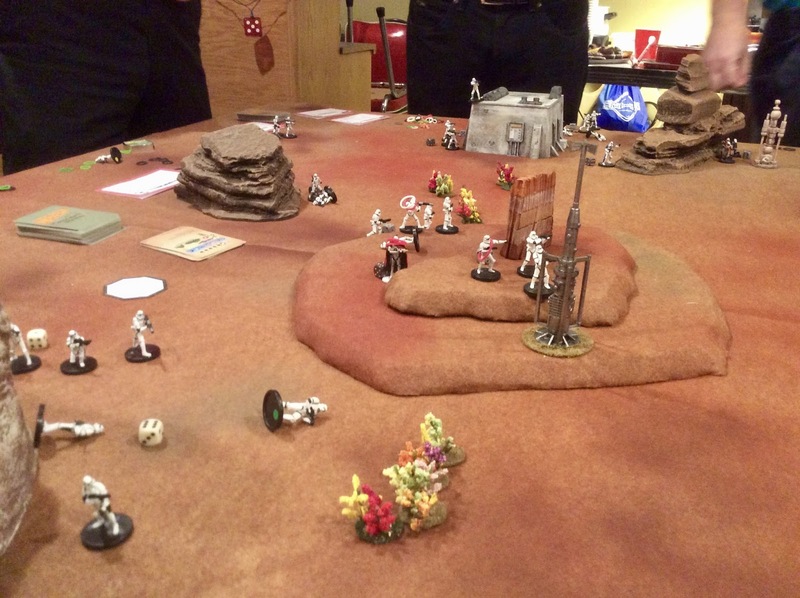 Hearing the howls of the Wookie charge, the Sand People come out of their hiding places, and begin sniping at the Imperial troops from a tall cliff in their rear. As the battle rages on the AT-AT gets closer and closer. It takes several hits, but none penetrate. 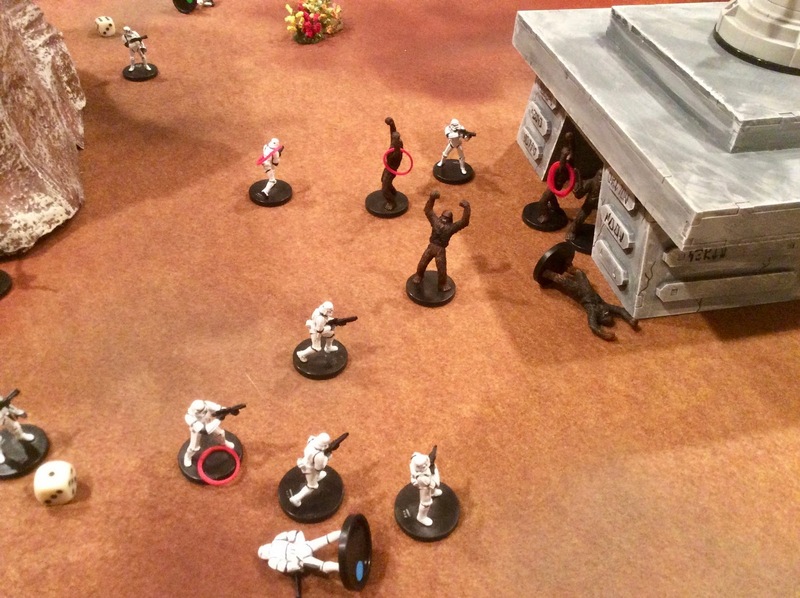 With many of their compatriots dead or wounded, some troopers slowly approach one of the vaporators to blow it up. 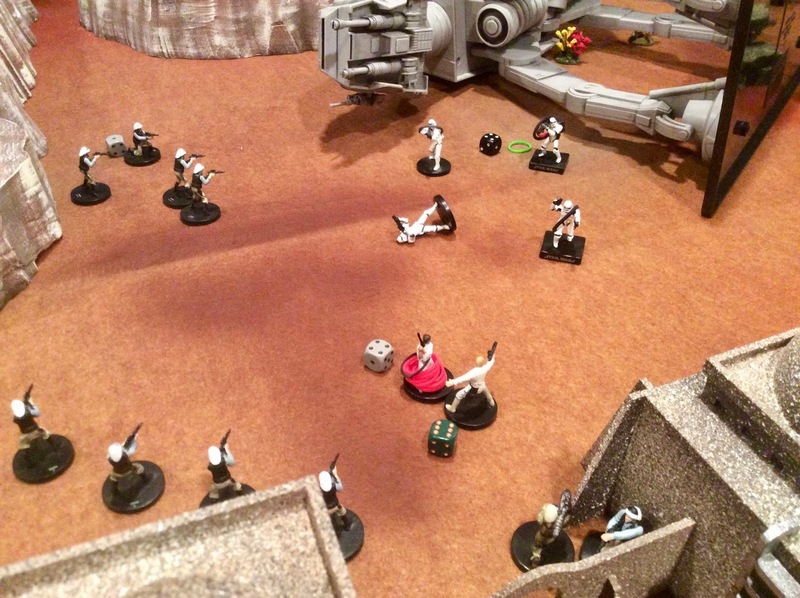 With time running out, Princess Leia rushes from cover and plants a thermal detonator on the leg of the AT-AT. It explodes with a Penetrating Hit, causing the large machine to topple over. Despite the destructing of the AT-AT, the special commando squad it was carrying survives, and exits the wreckage, laser blasting. They critically wound the Leia (Reduced from 9 Endurance Points to 1), and move in for the kill,;as rebel troops from all around rush out of their cover and towards the Princess to save her. Then, having spent most of the game hiding, Luke runs out to her aid, helping her get to safety. At that point the game was all but over. We played a few more turns, but with the loss of their AT-AT the writing was on the wall for the Empire. 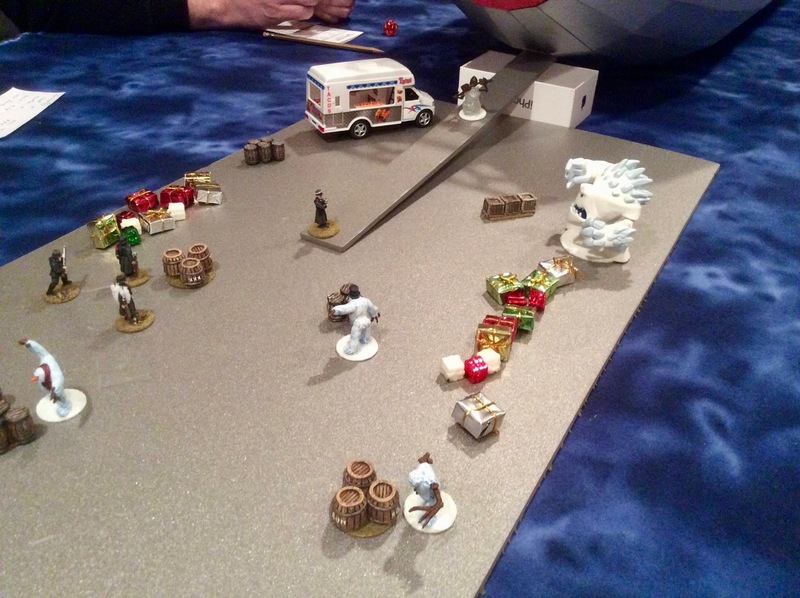 After the Star Wars game, we reset the table for some Pulp action featuring Nazis trying to commandeer Santa’s Zeppelin on Christmas Eve. The rules we used where Blood and Swash skirmish rules, with some slight modifications to make them more Pulp flavored. Along with Santa and his daughter Nicole, there were a variety of defenders which started on the Zeppelin; including Toy Soldiers, Teddy Bears, Elf Militia, Else, Anna, Kristof and Sven from Frozen, Hermie and Rudolph from Rudolph the Red Nose Reindeer, perennial HAWKS action hero Duke Morrison and his buddies, including “Wrench” Webb with some infantry, and “Boats Morgan” with some Sailors. The Nazis brought along the Wicked Witch and her mechanical flying monkeys, as well as some Evil Snowmen. To win, the Santa and his friends needed to load six special A Christmas Story themed tokens (Leg Lamp, Red Ryder BB Gun, Fra-Gee-Lay Crate, Pink Bunny Slippers, Blue Bowling Ball and Can of Simonize, and a Almost Cooked Turkey, that were spread around the Zeppelin, and load them on to his sleigh before the actual time hit 11:55PM. At that point Santa’s Sleigh would have to launch out the loading bay doors and on to deliver the presents. If something happened to Santa, then his Daughter Nicole, Elsa, Anna, or Hermie the Elf were also qualified to be able to drive the sleigh. The Nazis had to prevent the sleigh from launching by either stealing the special tokens, delaying the good guys from retrieving the tokens, or killing all the eligible drivers. Evil Snowmen and Nazis fight “Boats” Morgan and his sailors out on the mooring dock, while some of the bad guys head up the ramp and into the ship. It was a fun game with the Good Guys worrying at first that their animated toys were no match for the enemies’ automatic weapons; but eventually the Nazi’s isolated entry points (some came up the front ramp, and some entered at the left and right nacelle access hatches) allowed Santa and his friends to isolate them and slowly eliminate them. What did hamper the Good Guys was locating the last present and getting it into the sleigh on time With less than a minute left, an Elf Militiaman was able to toss the leg lamp into the sleigh, and it safely took off, guaranteeing a Merry Christmas for all the good little boys and girls. A closer view of the action inside. 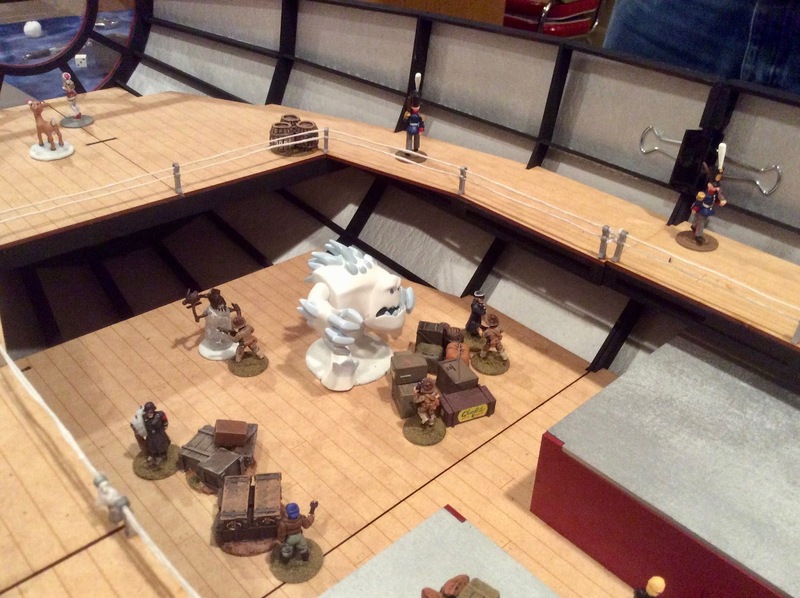 Marshmallow, the evil snow monster, takes on some soldiers inside the zeppelin. A Teddy Bear officer battles two Nazis. 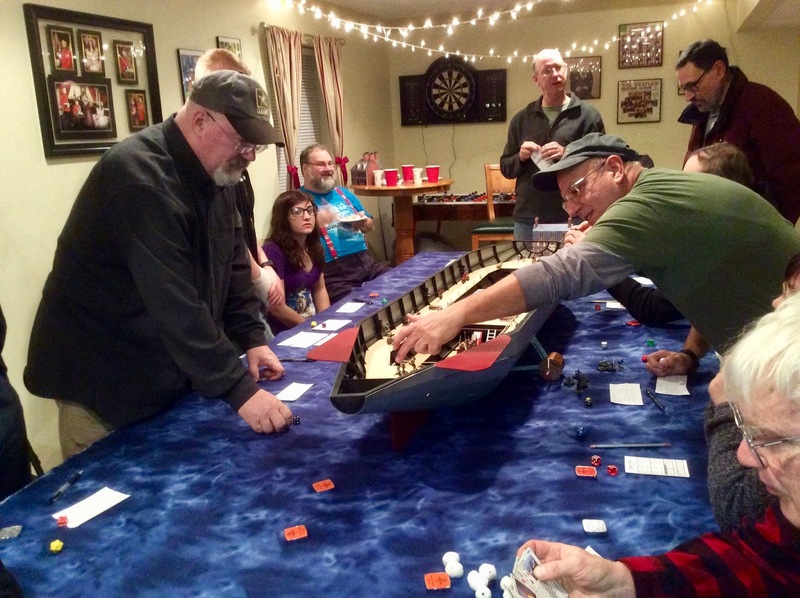 As the clock ticks down (just visible above the zeppelin’s tail fin on the left) players rush to achieve their objectives. In the final seconds, one of the Elf Militia tosses the Leg Lamp into the sleigh, as Elsa prepares to take off, along with Kristof. Santa had been taken out earlier by one of the Wicked Witch’s Flying Monkey Leaders.